This week we take a break from our usual programming to bring you a Boardspan Special Report on Managing Through a Crisis. DIRECTOR'S DOMAIN: Shareholders make their voices heard in the boardroom this week. Hedge fund Starboard Value installs its chief executive as the chairman of pizza chain Papa John’s. An investor group wins support from the BP board to increase climate-related disclosures. An activist investor gets the ear of drugmaker Allergan with its demand to split the chair and CEO roles. Meanwhile, Starbucks COO Rosalind Brewer joins the board of Amazon. A report shows women now hold 30% of board seats in Australia’s top 200 companies, but a critical analysis suggests that a handful of women sitting on multiple boards may undermine the picture of diversity painted by this news. The Intel board names the company’s next CEO and the Nissan board apparently plans to dismiss former CEO Carlos Ghosn from the board at a special meeting in April. Plus our own Boardspan board member Mary Cranston, who has been a director of seven public companies, offers some sage advice on ensuring healthy board dynamics in The Three Attributes of Wise Boards. Read on. DIRECTOR'S DOMAIN: Spot on. State Street, alongside many others including Boardspan in our top ten hot topics of 2019, recognizes that oversight of corporate culture is a board priority for the new year. In a letter to public companies the investment firm urges boards to take a proactive role in this area and offers a framework for doing so. Meanwhile, the Alphabet board faces a shareholder lawsuit for its role in the alleged cover-up of sexual harassment claims made against senior executives. The board of privately held WeWork is taken to task by the media for apparently allowing the CEO to profit from leasing property he owns to the company. The board of Purdue Pharma, maker of the pain reliever Oxycontin, is sued by Massachusetts’s attorney general for its role in the opiate epidemic with new allegations suggesting that members of the Sackler family, the majority owners, pushed aggressive sales tactics even after there was evidence that the drug was being abused. Taken together, it does look like company culture will play a prominent role in business again this year. On another note: the government shutdown may cause extra headaches for boards if the short-staffed SEC is unable to review offbeat shareholder proposals that companies would like to see dismissed. Read more. From all of us at Boardspan ... Happy Holidays! Director’s Domain will take a brief break and see you in the New Year. DIRECTOR'S DOMAIN: Naughty or nice, activist investors continue to make their presence felt. They invested an astonishing $74 billion in the year that ended in September, mostly in large companies that they hope to make more profitable, often by reshaping boards and, with them, strategic decision making. This week’s news shows the trend continues with an American hedge fund taking a $1 billion stake in France’s Pernod Ricard and looking for changes to the board, and other major shareholders signaling they want to see change at Yelp and Cars.com. Tesla CEO Elon Musk is back in the news, saying in a 60 Minutes interview that it’s unrealistic to expect the largest shareholder to defer to the chairman of the board and that he does not respect the SEC. He later clarified his views on Twitter, claiming that Tesla will retire the role of chairman in three years. Legal experts offers some insights into the legal implications of a CEO making pronouncements by Tweet. Another legal team offers some helpful info on what to expect in the 2019 proxy season. And the word is in: Women have the most success gaining board seats where quotas are imposed by law. Read On. DIRECTOR'S DOMAIN: Oversight. The word can, of course, refer to the all-important governance function of ensuring that the executive team is properly carrying out its responsibilities, and yet it can also refer to a lapse or mistake or neglect of something. When a board doesn’t live up to the first definition, it usually ends up defending accusations that it has engaged in the second. The Nissan board is in that situation, following the arrest of its now-deposed chairman, Renault CEO Carlos Ghosn, who is accused of financial improprieties that observers say would not have been possible if the board had been doing its job. Oversight, (the governance function), would be the best form of damage control for Facebook, suggests one observer, who advises CEO Mark Zuckerberg to “submit to governance” and let the board assume the role of his boss, as a way to right the beleaguered social media company. And oversight is presumably what activist investors wanted at Campbell Soup, where they have won the right to install two board members and participate in the election of a new CEO. In other news, as “ESG” programs move from “nice to have” to “must have” in the eyes of many, Google employees, once again, aim to persuade the leadership team to place more value on the “Social” aspects of business; on Wednesday hundreds of employees signed a letter protesting a deal that would bring a censored version of the search engine to China. Continue Reading. DIRECTOR'S DOMAIN: Harassment. It’s a topic that is clearly not going away. The New York Times reported last week that three former Google executives had been protected by the company after it had concluded they had engaged in sexual misconduct—one executive allegedly walked away with a $90 million package. The critical query of “What did the board know?" has been making the rounds, along with bitter complaints by employees, some of whom plan a walkout today (Thursday). Meanwhile, some 250 people, so far, have been interviewed as part of ongoing investigations into the culture at CBS, where several top executives including CEO Les Moonves were ousted for alleged misconduct. Fortunately, new approaches to harassment prevention continue to be explored. Tesla’s board faces a shareholder lawsuit accusing it of covering for Elon Musk and his troublesome tweeting. CEO Mark Zuckerberg is summoned to appear before UK and Canadian parliamentary committees, which seek information on Facebook's data collection and sharing policies. Plus, we've gathered some great insights here for boards wondering how to guide their CEOs in this era of corporate activism or how to ensure diversity throughout an organization. Read More. DIRECTOR'S DOMAIN: Executives as diplomats. Prominent corporate leaders this week find their business relationships, ethics, and reputations mixed up with a political crisis that only underscores how complex and dynamic global business culture has become. The disappearance and alleged murder of Saudi journalist and dissident Jamal Khashoggi on the eve of a high-profile Saudi business conference, and as the board composition of a major new Saudi initiative was announced, makes evident the diplomacy now expected of top leadership. Many executives have backed out of the conference and off the board, but given the billions of dollars of Saudi investments in U.S. businesses, this topic is likely to dominate board conversations for some time. Meanwhile, a number of public pension fund managers issued a call for Mark Zuckerberg to relinquish the chairman role at Facebook. Heirs of the original Campbell’s Soup family are complicating the plans of a hedge fund looking to reseat the board. Research shows that older, larger companies are making great strides toward gender diversity on boards—while fresh-faced startups are not. Plus, Boardspan CEO Abby Adlerman offers her perspective on the Chair-CEO role in a Reuters article on Citigroup CEO Mike Corbat. Read More. DIRECTOR'S DOMAIN: Coming soon to boardrooms: More women. At least, that’s what a new law signed last weekend by California Governor Jerry Brown aims to ensure. Critics have been quick to point out various flaws in the legislation, and it will be interesting to see which organizations will sue and take on a very public fight to protect the perpetuation of all-male boards. Investors, too, are demanding greater female representation on boards: State Street this week said it has already voted against 500 nominating committee chairs on all-male boards and warns others that have not heeded its calls for change that more "no" votes are yet to come. Meanwhile, the SEC will require Tesla CEO Elon Musk give up his role as chairman of the electric carmaker as punishment for his inappropriate tweeting; a New York Times report on how Musk’s deal with the government fell apart and came back together only underscores how much influence he carries with the board. The Times’ pursuit of another story—how non-profit medical center executives profit from their appointments to for-profit healthcare boards—has resulted in some major shakeups at New York’s Memorial Sloan Kettering Cancer Center. Meanwhile, embattled retailer J.C. Penney names former Joann Stores CEO Jill Soltau as CEO. Read More. DIRECTOR'S DOMAIN: Information is powerful—if you have access to it and trust its source. That “if” plays a crucial role in various boardroom dramas unfolding this week. Theories are circulating as to why the CBS board, which apparently learned months ago of sexual harassment allegations against CEO Les Moonves, did not act until this week to negotiate his departure and remake the board. Other theories are in the air about why a Goldman Sachs executive’s call to a whistleblower line was not reported to the bank's board. Meanwhle, Facebook directors are being sued for allegedly putting the interests of CEO Mark Zuckerburg over shareholders. Jack Ma announced that his upcoming retirement from Alibaba comes after 10 years of succession planning to ensure the company’s enduring viability. The U.S. Olympic Committee elects Susanne Lyons as its new Chair, while underscoring their emphasis on keeping athletes safe. Read More. DIRECTOR'S DOMAIN: Does corporate governance fulfill its mission? As Senator Elizabeth Warren and President Trump propose radically different reforms to governance regulations, observers take up the overarching question of what governance could and should be. The House of Representatives is considering new governance norms of their own with a bill that would prohibit legislators from sitting on corporate boards. Meanwhile, the battle for control of pizza maker Papa John’s continues, with the founder and board pitted against one another in an intensifying and very public fight. The Tesla board is criticized for failing to rein in CEO Elon Musk. And a new study of hedge funds sounds a warning to boards approached by activists: demands for cost-cutting don't often yield the favorable results sought. While the responsibilities and challenges facing boards are growing, the number of people seeking these roles continues to grow, too. We are often asked how to pursue a board opportunity—see our Boardspan Library article below for three easy steps you can take to help you land a seat. Read More. DIRECTOR'S DOMAIN: Diversity in leadership, a perennial topic in business media, gets plenty of buzz this week. Erika Hayes James, dean of Emory University's Goizueta Business School, joins the SurveyMonkey board, bringing the software company’s board to gender parity. California moves one step closer to a quota system, which would require more female representation on boards, and critics make noise. Reports of the decreasing number of women CEOs of large companies continues to reverberate after Pepsi CEO Indra Nooyi’s resignation announcement last week -- and Boardspan CEO Abby Adlerman discusses how boards can reverse the trend. Meanwhile, the Tesla board found itself defending CEO Elon Musk’s assertion that the carmaker has been pursuing privatization; it named a special committee to evaluate the options, even as the SEC reportedly subpoenaed the company for information about Musk’s tweets. A congressman’s arrest over insider trading charges is inspiring a closer look at whether legislators should sit on corporate boards. At least one pundit is asking why Les Moonves hasn’t stepped down at CBS and whether his alleged misconduct will be overshadowed by other revelations from CBS’s legal battle with Viacom. Read on for all the details. Read More. DIRECTOR'S DOMAIN: Where are the women? Opinions abound as to why the Fortune 500 C-suite, which peaked at 32 women CEOs last year, is not diversifying more rapidly. When Indra Nooyi leaves Pepsi later this year, only 24 women will sit atop Fortune 500 firms. Perhaps the defense industry has something to teach others, as three of its largest companies will soon have women chief executives. In other news, Tesla’s board issued a statement suggesting that CEO Elon Musk’s remarks about taking the carmaker private were not just idle tweeting; nevertheless, experts expect the S.E.C. will investigate his market-moving comments. Salesforce has a new CEO—make that a co-CEO, as Keith Block joins Marc Benioff in a dual CEO-ship. The CBS board has taken charge of three investigations into sexual harassment and workplace culture at the media company. Rep. Chris Collins (R-New York) is arrested for insider trading, accused of passing along information he learned as a board member to family members who traded the stock ahead of news that sent the company’s shares sliding. Read More. DIRECTOR'S DOMAIN: Complicated times. The CBS board, in the midst of a lawsuit likely to determine the company's chance of remaining independent, must now consider whether longtime CEO Leslie Moonves will continue to lead the media company in the face of allegations of sexual harassment. For now Moonves, who denies any wrongdoing, remains in charge. Separately, Moonves and other CBS executives are accused of destroying evidence related to the battle for control of the company. Meanwhile, Mike Cagney is back in the money: The former CEO of SoFi received financial backing from two venture capitalists who sat on the SoFi board when Cagney was ousted following an investigation that revealed he was having an extramarital affair with a coworker, though he had told the board he was not. Papa John’s founder, who was forced to resign his role as chairman after reports he made a racial slur, is now suing the company for communications between board members related to the decision to oust him. The board and management of Univision are embroiled in a dramatic feud. And in other news, Land O'Lakes announces new leadership, bringing the number of women CEOs in the Fortune 500 to 25. Read More. DIRECTOR'S DOMAIN: CEO turnover. It’s happening more often and with less predictability than ever before. This week a Canadian pipeline company lost its CEO amid a board investigation. Lululemon presented its new CEO, several months after the apparel maker’s former chief executive stepped down following allegations of misconduct. The CEOs of Fannie Mae and Gilead Sciences announced their departures. We learned that Fiat Chrysler’s CEO died unexpectedly following surgery. Boards that haven't mapped out a leadership path for the future will want to check out the Wall Street Journal article on the importance of succession planning for catastrophic events and learn about the real costs of not having a strong succession plan in this article from the Boardspan Library. Organizations that have recently been through a CEO change might take a closer look at the three actions Harvard Business Review suggests boards can take to help new CEOs address their leadership development gaps. In other news, the board of Papa John’s put in place a “poison pill” to prevent the company’s founder from regaining control. And the median pay to corporate directors hit $300,000. Read more. DIRECTOR'S DOMAIN: Second thoughts: Papa John’s founder resigned as board chair, but now thinks he made a mistake by doing so, saying the board pressured him to step down before it had conducted an investigation into his alleged use of the “n-word.” It turns out that (Papa) John Schnatter was also in talks with Wendy’s about a possible merger at the time. Texas Instruments chair and former CEO Rich Templeton is back in the corner office just months after announcing his retirement; he returns to the job after newly promoted CEO Brian Crutcher resigned over an apparent violation of the company’s code of conduct. Meanwhile, if you were wondering whether the GE board could have done more to prevent the company’s downturn, you’ll be interested in an analysis in Harvard Business Review that suggests there were three big problems with the board that might have made a difference. And if you missed it last week, be sure to read Boardspan CEO Abby Adlerman's latest thinking on governance in this era of rising board expectations. Read More. DIRECTOR'S DOMAIN: #MeToo hasn't been dominating headlines of late, but the movement’s impact continues to be felt in the boardroom. This week the Miss America pageant’s board is in upheaval after new chair Gretchen Carlson, whose accusations of sexual harassment ended the career of Fox News chair Roger Ailes, pushed to end the swimsuit competition. Lawyers say executive compensation agreements are being rewritten to include clawbacks for harassment-related resignations and other measures designed to deter bad behavior. In other news, shareholders voted a Bed, Bath & Beyond director off the board as a protest of the executive compensation plan. McKesson shareholders are targeting an audit committee member to protest what they see as the company's failure to mitigate the risks of distributing opioids. And Dow Chemical settles with the SEC after a three-year investigation into the reporting of executive perks--a move seen by some observers as an SEC warning to all. Amid it all, one thing is clear: The pressure on boards to prevent crises of misconduct, accounting, and much more, while providing sound strategic advice is changing the expectations for board service. Read Boardspan CEO Abby Adlerman's latest article for insights you can use on governance in this new era. Read more. DIRECTOR'S DOMAIN: How to achieve more diverse boards? Let us count the ways: California considers a gender quota system. New York City's Comptroller requests companies be more transparent with their diversity stats—and gets a measurable response. Real estate investment trusts, presumably responding to public pressure, elect women directors in record numbers. --All of this may be good news for the organizations affected, as a new analysis suggests that companies with more female directors are less likely to be targeted by activist investors. Meanwhile, GE is revamping its business and its board. Increasingly, technology company directors don't hear shareholder complaints... because they are skipping annual meetings. An analysis by a couple of Canadian professors shows that a stronger board can mean less CEO pay. Plus a series of Q&As with prominent board members in Forbes offers some interesting insights. Click here to read all about it. DIRECTOR'S DOMAIN: Let’s face it – being a CEO is not for the faint of heart. One day you’re on top of the world and the next day you feel squashed like a bug. And guess who has the ultimate accountability to make things right, better yet help preempt the problems? The board, of course! As Volkswagen’s supervisors struggled to find their footing, Theranos’ woes continue to get daily press and even state university regents lose their way, boards need to help find true north with and for their CEOs. The Wall Street Journal suggests we should humanize our leaders just a little bit more. And as we go to press, we’re watching the news of Intel’s CEO resignation over an employee fraternization matter. All that and much more in today’s Director’s Domain…happy summer solstice to all. Read more. DIRECTOR'S DOMAIN: The shareholders are restless. In the past week, annual meetings at Facebook, Google, and Tesla have been scenes of protest, complaint, and shareholder proposals—evidencing a growing frustration not only with governance issues, but with the power tech companies have to influence outcomes for other businesses, consumers, and citizens. Activist investors demand that pharmaceutical company Allergan split the chair from the CEO’s role. Meanwhile, Starbucks announces that its chairman Howard Schultz is leaving the board but retaining the right to sit in on meetings; pundits suggest the coffee company founder will seek political office. The U.K. Department for Business, Energy & Industrial Strategy releases comments from U.K. executives attempting to justify the lack of women directors, and let’s just say, they seem to say more about the commenters than about women directors. And, if it wasn’t already apparent, Forbes points out that a shift in public perceptions is leading more people to view boards of directors as responsible when companies experience ethical lapses. Read more. DIRECTOR'S DOMAIN: Crisis management. In an era where consumers, employees, shareholders, regulators and the media are more attentive and vocal than ever, crises can grow quickly. And, the latest evidence suggests, regaining trust after a crisis is more expensive than ever. Just ask Facebook, Uber, or Wells Fargo. Fortunately, there are steps a board can take to be ready for bad news and traits a board can look for, and help cultivate, in its CEO to prepare them to lead through crisis. Read on for articles about both. It probably wouldn’t hurt to read this week’s primer on note-taking in the board room, too, so you know where your own scribbles could end up. As for this week’s crises: U.S.C. loses its president amid a sexual abuse scandal, a whistleblower accuses former Infosys directors of wrongdoing, and the boardroom battle for control of CBS returns to court. Despite the calamitous times, CEOs are feeling more optimistic than they have in years… Hmmm, sounds like a good time to prep for the unknown. Read more. DIRECTOR'S DOMAIN: Women CEOs, who last year held only 32 spots in the Fortune 500, continue to decline in number and are now down to 24. Some blame industry challenges for last week's sudden retirement of Denise Morrison from Campbell's Soup as well as the departure of Mondelez’s Irene Rosenfeld last summer. Regardless of reason, experts suggest that boards have not done enough to fill their pipelines with women who could take the helm. Meanwhile, one of the few African American men to lead a large company, Lowe’s new CEO Marvin Ellison, will be contending with activist investor Bill Ackman, who revealed a $1 billion stake in the retailer. The Amazon board, which recently acknowledged the need to include diversity candidates in future board recruitments, is taken to task for its current composition. Wynn Resorts shareholders voted down its executive pay plan. Facebook’s new director may escape a shareholder vote. USA Gymnastics remakes its board. And so much more. Read more. DIRECTOR'S DOMAIN: Boards that don’t live up to the expectations of shareholders and employees are getting an earful this week. Tesla is hearing from shareholders and proxy firms unhappy with what they see as a lack of independence on the board and too much power in the hands of Chair and CEO Elon Musk. A similar scenario playing out at Facebook has shareholders likening the company’s governance structure to 'a dictatorship' and proxy advisors withholding support for the reelection of CEO Mark Zuckerberg as Chair. Amazon, after initially rejecting a shareholder proposal on the topic, reversed course and adopted a board diversity policy after it had garnered employee support. Meanwhile, Shari Redstone and CBS are engaged in a high-profile battle, each trying to outmaneuver the other for control of the CBS board, and therefore decision-making power to decide whether to pursue a potential merger with Viacom; a judge has ordered both sides to refrain from further moves until he issues a ruling—expected today. Read more. DIRECTOR'S DOMAIN: Activism of all stripes is making headlines this week. Employees at Amazon are challenging the company’s stance on board diversity after Amazon opposed a shareholder proposal that would require it to formally consider diversity candidates. Shareholders of gun maker Sturm, Ruger & Co. won the firm's agreement to publicly report the actions it is taking to prevent gun violence. Investors in Telecom Italia defeated Vivendi in a shareholder vote, winning control of the board. Tesla shareholders proposed a change in directors that would leave CEO Elon Musk’s brother without a seat. And that's just some of the change demanded by activists! Meanwhile, new research shows that while all new CEOs generally engender short-term inefficiencies, over the long term outsiders tend to boost productivity more than those promoted from within. Another study shows the median salary of women CEOs of S&P500 firms bests that of men by nearly $2 million. And Netflix is upheld as an example of a new, more transparent era of board information. Changes, big and small, are shifting the landscape for boards. Read more. DIRECTOR'S DOMAIN: Just do it. Women at Nike took the company’s mantra to heart this spring, hurdling over the human resources department to create their own internal report on harassment and discrimination in the workplace. At least six top executives are leaving in the wake of the report and onlookers are now asking what the board could have done differently to recognize and disrupt a culture allegedly unfriendly to women. Meanwhile, What’sApp founder Jan Koum, who has sat on the Facebook board since selling his company to the social media giant in 2014, is apparently resigning over the company’s data privacy practices. Xerox’s chief executive and its chairman are both stepping down, as activist investor Carl Icahn appears to be winning the battle to keep the company from being acquired by Fuji. Saudi Aramco, the world’s largest oil company, appoints its first female director—an unexpected event in Saudi Arabia, where laws prevent women from making many of their own decisions. Goldman Sachs is called out for failing to improve the gender balance of its board. And proposals to increase the gender diversity of Canadian companies seem to be gaining ground. Read more. DIRECTOR'S DOMAIN: Fallout from the Wells Fargo scandals continues, with the bank now forced to give the Office of the Comptroller of the Currency the right to make changes to its executive ranks and board of directors. Of course, the board has undergone plenty of change since wrongdoing at the bank first became public, and now boasts five women on a 12-person board, including the first woman chair of a major U.S. financial company. Change may be in the offing for long-time board members at Wynn Resorts now, as Elaine Wynn, the casino company's largest shareholder, rallies investors to vote against cronies of her ex-husband Steve Wynn. In news you can use: Corporate Secretary weighs in with advice for preparing your company for the possibility of sexual harassment claims. The Wall Street Journal offers a terrific view into Southwest Airlines’ crisis management practices following last week’s deadly engine blowout. Finally, Strategy+Business suggests that if you sit on a board and are concerned about the CEO’s performance, don’t wait too long for “proof” that things aren't going well. Your willingness to appropriately address concerns early could be just what’s needed to avert disaster. Read on. DIRECTOR'S DOMAIN: How's this for a refreshing idea: almost half of directors appointed to the boards of S&P 500 companies last year were novice board members, and of those, the majority were women or minority candidates! In other news, the data mismanagement scandal that led Facebook CEO Mark Zuckerberg to testify before Congress last week has become, this week, a rallying cry for institutional investors demanding governance changes at the social media giant. Several firms are speaking out about what they see as a need for greater board diversity and independence, a separation of the chair and CEO roles, a new risk oversight committee, and more. Meanwhile the sexual harassment scandal that led to the resignation of Steve Wynn as CEO of Wynn Resorts is responsible for ushering in a self-described “new era” at the casino company, which yesterday announced the appointment of three women to its male-dominated board. Even so, most boards are not talking about harassment, a recent poll finds, as directors believe it’s not a problem at their companies. It will be interesting to see if the increasing numbers of newly appointed women and minority candidates agree... Keep reading. DIRECTOR'S DOMAIN: How to improve corporate governance? Not surprisingly (given the sway corporations have over economic, political, and environmental issues), this question is getting a lot of attention. Senator Tammy Baldwin suggests giving workers, who are directly affected by governance decisions, a say in who sits on the board, even as researchers study how machine learning could help companies build better boards. The MIT Sloan Management Review suggests that a modern board of directors must ensure not just that the company is pursuing its mission, but that it does so with concern for all stakeholders, not just those who have a financial interest in the company. And Venture Beat boasts a piece about the need for boards of AI companies to tackle ethics head on. These conversations are taking place amid the backdrop of data scandals, like those at Facebook and Equifax, as well as rising concerns about how humans will fare in a world of artificial intelligence. Much is at stake and yes, absolutely, this is an important question to be asking. DIRECTOR'S DOMAIN: Another week, another disappointing board diversity statistic. Make that two: 1) Men outnumber women in leadership roles on all board committees by more than four to one. 2) The Federal Reserve Board's leadership is currently 80 percent male and 87 percent white. Meanwhile, the board of the Humane Society is under attack from some of its largest donors. Facebook directors face a shareholder suit accusing them of breach of fiduciary duty in the exposure of 50 million people’s personal data. Japan is rewriting its governance code. And a couple of business professors opine on why many CEOs are taking the lead as social activists. Also, if you are curious what its like to be in the room when BlackRock meets with board members to discuss policies affecting company culture and diversity, etc., you’ll find a pretty detailed list of the kinds of questions they ask below. Perhaps such conversations will eventually lead to some more encouraging diversity stats! Read more. DIRECTOR'S DOMAIN: For the past five days, Facebook was top of the news following the revelation that lax protocols allowed the data of 50 million Facebook users to be illicitly shared with British data company Cambridge Analytics—news which caused the share price to plummet dramatically. Much was made of the fact that Chairman & CEO Mark Zuckerberg did not immediately address the situation publicly, though on Wednesday he offered an apology and laid out plans for shoring up the company's data privacy practices. Meanwhile, the Cambridge Analytica board immediately suspended its CEO after an undercover report showed him purportedly promoting unethical practices. In other news, CEO pay is now at its highest in history. Asset manager BlackRock is pushing boards to make progress on diversity, culture and compensation structure. New data shows that shareholder proposals now target environmental and social concerns more than governance issues. Some 82 percent of companies worldwide assign climate risk oversight to their boards. And more women are laying claim to the COO role. Read more. DIRECTOR'S DOMAIN: It’s hardly news that CEO salaries have grown handsomely in recent years. Still, with new SEC rules requiring companies to explicitly state the difference between the chief executive and median worker salaries, outsize salaries are turning heads, as media outlets point fingers at company after company stating sizable pay differentials. Our first thought: Armed with all this data, it wouldn’t be surprising to see shareholders take aim at big pay packages. Indeed, Disney shareholders this week voted for the first time ever against a proposed pay plan for CEO Bob Iger. In other news, Goldman Sachs makes public its succession plan for the top job. The SEC charges Theranos CEO Elizabeth Holmes with committing massive fraud and separately charges a former Equifax executive with insider trading based on his early knowledge of the firm’s cyberbreach. The Wynn Resorts board is sued by the State of Oregon and two directors signal their departures. On another subject: For those curious about director liability in light of recent cases of corporate misconduct, we found timely insights in this post by two legal scholars at Berkeley Law. It is a synopsis of their paper, The Hidden Power of Compliance, which examines “four mega scandals: the General Motors ignition switch failure, the Washington Mutual collapse during the financial crisis, the security breach in Yahoo, and Wells Fargo’s fake accounts fiasco. While legal and compliance personnel are at the heart of the inquiry in all cases, their interaction with the board in each setting is different, changing the liability outcome.” Read on. DIRECTOR'S DOMAIN: A governance guide for the #MeToo era: A group of pension funds that together manage more than $3.5 trillion in assets issues a report on sexual harassment and the risks it poses to corporations, with some fairly specific recommendations for boards and an extensive list of governance questions for investors to ask boards. Meanwhile, asset managers come under attack for rubber-stamping exorbitant CEO pay packages, even as the largest comp plan in history gets a nod of approval. The Nordstrom board rejects the family’s $8.4 billion bid to take the company private. And Broadcom’s proposed takeover of Qualcomm could be derailed by a U.S. government body concerned that a merger may negatively affect the country’s technological competitiveness and even its national security. Read on. DIRECTOR'S DOMAIN: General Electric announced a radical board shakeup—more than half of its 18 directors will exit, three new directors will join, and the overall size will shrink to a more manageable 12-person board. Three of the four longest serving board members, all women, are out, leading to women occupying only 17% of the seats. Meanwhile, a report by Nordic bank Nordea suggests companies with more women leaders produce more stable returns. But in countries where quotas have ensured more women on boards, The Economist tells us, there has not been an increase in women executives. And as gender-pay-ratio disclosure becomes mandatory in the UK, Barclays shows how much less women earn, primarily because they are excluded from senior management roles. Plus, the New York Times reveals the details of how an all-woman leadership team failed to take over the Weinstein Co. Read more. DIRECTOR'S DOMAIN: The fallout from alleged sexual misconduct rattles corporate America and increases pressure on boards again this week. Ford executive Raj Nair admits to inappropriate behavior and steps down. Guess Inc. cofounder and chairman Paul Marciano takes a leave amid allegations of sexual harassment. Thomas Schumacher, the leader of Disney’s theatrical division, whose production of “Frozen” opens on Broadway today is accused of lewd behavior. The board of Wynn Resorts announces that former CEO Steve Wynn is not eligible for a reported severance package of $330 million. And a lawsuit against the Weinstein Co. prompts the board to fire the COO and complicates a potential sale of the company that had promised to remake the board as a woman-only entity. These cases and the many others that have arisen in recent months have cost corporate America money, share price, employees, and reputations, and are leading boards to take very seriously their responsibility to prevent misconduct and ensure a safe workplace. Commenters suggest that while more diverse boards are one step in the right direction, seating women and people of color on boards, alone, cannot combat entrenched cultural issues. Instead, experts suggest a 5-step approach boards should take to ensure appropriate disincentives for bad behavior are in place. In other news, the CEO of Gap Inc is out after failing to boost profits. Slack builds its board, driving speculation it is preparing for an IPO. And activist investor Nelson Peltz takes his seat on the Proctor & Gamble board. Read more. DIRECTOR'S DOMAIN: Will boards of directors save the world? If you think that question sounds far-fetched, the latest news out of the nation’s business schools might make you think again. A professor at Harvard Business School suggests that companies are adopting corporate social responsibility (CSR) policies more readily than ever before, in part because customers, shareholders, and employees recognize the need to address major issues like wealth inequality and climate change and are losing confidence that government will do so. Researchers at Northwestern's Kellogg School of Management studying companies whose executive comp plans include specific CSR benchmarks found that setting such targets led to significant progress on social and environmental goals and gains in long-term value. ISS, meanwhile, notes that shareholders are pressing more companies to disclose business risks related to climate change. In other news, Chipotle gets a new CEO; Xerox shareholders balk at Fuji deal; the board of the U.S. Hispanic Chamber of Commerce parts with its CEO amid allegations of improprieties; and a new report shows that women have made real gains in those C-suite roles that don't typically lead to the CEO job. Read on. DIRECTOR'S DOMAIN: Let this sink in: “We simply expect much more of boards of directors than ever before.” So said incoming Federal Reserve Chairman Jerome Powell in August. This week, Powell and outgoing Fed Chair Janet Yellen underscored that message as the Fed announced it is restricting Wells Fargo from growing its business until it addresses its governance shortcomings. The regulators also unofficially but unambiguously forced out four directors who had been on the bank’s board as its multiple scandals unfolded. Former Treasury Secretary Lawrence Summers jumped right in to ask why the Fed didn’t name names—and made a case for the public shaming of board members who fail in their duty as watchdogs. Others echoed the sentiment, and commentators suggested the action against Wells Fargo’s board should be seen as a warning shot over the bow of all corporate boardrooms, especially banks. Critics took aim, too, at the Wynn Resorts board which some suggest was filled with cronies of CEO Steve Wynn and failed to provide adequate oversight; Wynn stepped down this week amid allegations of sexual harassment. Canadian active wear company Lululemon also lost its CEO to unnamed behavioral issues presumed to concern employee relations. And Sheryl Sandberg’s LeanIn.org finds that the spate of CEO dismissals in the #MeToo era is scaring some men from mentoring women colleagues, even as women contend with a narrower path than men to the C-suite and, as yet another study points out, the boardroom. Read on. DIRECTOR'S DOMAIN: From hush money to zero tolerance... When it comes to boards addressing sexual harassment, time is moving at light speed. Less than four months since the Harvey Weinstein scandal broke and the #MeToo movement launched, the perceived responsibility of the board has been radically altered according to a Hastings Law professor and a Rutgers University historian. Quiet settlements to resolve accusations of sexual misconduct are now likely to be seen as a breach of board duty, they say, while firing without severance (after careful investigation) is becoming the new normal. So, where does that leave the Wynn Resorts board, accused of approving payments to settle sexual misconduct claims, overpaying the CEO, and other acts of poor governance? Now, facing investigations and potential lawsuits for alleged breach of fiduciary responsibility and failure to fulfill its duty of CEO oversight. Meanwhile, new studies show that women-led startups land only 2% of venture funding, and that women still lag men in startup hires. A more promising report shows that the most diverse companies are the most innovative—with diversity measured in terms of gender, race, age, and more. And that makes a nice segue for this news: Airbnb, like Facebook last week, is also welcoming former American Express CEO Kenneth Chenault to its board. With the addition of their first black director, the vacation rental company pledges that, next, it will add its first woman director. Read on. DIRECTOR's DOMAIN: Pay for performance. The concept was stretched mightily this week by Tesla, which announced that CEO Elon Musk will either hit a series of wildly ambitious targets and be paid so handsomely some say he will become the richest man in the world, or he will not earn a dime for his efforts at the electric car maker. Pundits immediately labeled it a publicity stunt, analytical minds began parsing just what it would take to hit the end goal of $650 billion, and at least one commentator argues that the precise targets could persuade Musk to obsess over short-term results at certain junctures. Meanwhile, women CEOs are more likely to experience a different kind of targeting—finding themselves in the crosshairs of activist investors; a new study shows women CEOs are more likely to be on the receiving end of activist incursions than their male counterparts. In a different study, McKinsey updates its oft-quoted 2015 report and reaffirms that (racially and gender) diverse executive teams correlate with better financial results. And notably, Facebook adds its first non-white board member. Read on. DIRECTOR'S DOMAIN: Note to Boards: Shareholders are looking for companies to make real strides on social and environmental issues. The CEO of investment management firm BlackRock wrote a letter to companies that his firm invests in, saying BlackRock expects them to show how they are contributing to society. Wells Fargo has set up a new advisory council, headed by its board chair, to hear from stakeholders about their environmental and social concerns. The Harvard Business Review suggests “the worlds of activism and impact investing are converging much more swiftly than most people realize — and this union holds enormous promise for those who wish to see the creation of capital markets that support sustainable economic development.” Meanwhile, another convergence—that of media and technology—is pushing Facebook COO Sheryl Sandberg and Twitter CEO Jack Dorsey off the Disney board. In recognizing the conflicts with Disney's evolving business that these directors increasingly face, neither will stand for reelection in early March. Critics are calling on Disney to take the opportunity to diversify its predominantly white board. Separately, Britain’s requirement that companies report the gender pay gap has resulted in some disappointing statistics: Men out-earn women in all fields. Shareholders will raise their voices about that, no doubt. Read on. DIRECTOR'S DOMAIN: No doubt about it, more is being asked of boards. Shareholders are pressing the Facebook board to initiate a risk committee to address concerns about “fake news” and social media addiction. Investors are demanding that the Apple board address issues surrounding alleged physical and mental harm the company’s products may do to children. Employees are winning more expensive class action suits against companies that don’t treat them fairly, which in turn will put more pressure on boards to oversee HR policies and workplace compliance issues. Plus, rapid changes in technology are requiring some board members to go all-out to stay on top of the latest innovations—in some cases traveling as far as China on board “field trips” designed to expand their tech knowledge. It’s a lot to manage, and yet these many make-or-break issues cannot squeeze strategy out of the board conversation. In fact, Harvard Business Review suggests a new era of breathtaking innovation will demand that corporations commit to bigger picture thinking and greater, long-term risk taking. We think the best way to handle the increased pressure is by devoting a little more time to preparing, so you can spend less time to reacting. To get started, see Boardspan's special report: “The 2018 Boardroom: 7 Issues That Shouldn’t Take You By Surprise.” Or Read on. DIRECTOR'S DOMAIN: It may be a new year, but sweeping changes set in motion in 2017 will continue to shape boardroom dynamics. Among the trend stories worth noting: More corporate directors are being held personally responsible for their companies’ misdeeds. More CEOs are being fired, or not hired, by boards unwilling to overlook allegations of inappropriate behavior. More CEOs are concerned that cyberattacks and disruptive technologies pose real threats to their success. And more mergers than at any point in history means the playing field for all businesses are being redefined. Meanwhile, Netflix and Goldman Sachs were among the first to respond to the new tax code by making changes to executive compensation. Uber is adding six new board members. Erich Schmidt is stepping down as Alphabet’s executive chairman, while Tim Cook is stepping up as the first CEO (that we know of) whose board will not permit its CEO to fly commercial. And in the latest sexual harassment scandal, executives and board members of the Miss America Organization resigned after allegedly exchanging disparaging emails about contestants; several former Miss America winners will now join the board, including Gretchen Carlson, who received a $20 million settlement after accusing then-CEO of Fox News Roger Ailes of sexual harassment. Whew. Welcome to the new year! Read on. DIRECTOR'S DOMAIN: As 2017 comes to a close, we look back at the prominent boardroom trends of the year to see where we’ve been and prepare for where we might be heading. It’s been a rollicking year for boards, with pressure building on all sides from activist investors, the media, institutional shareholders, and all who are concerned about sexual harassment in the workplace. We culled six prevailing topics from the year’s board news—all of which may be harbingers of the challenges we expect boards to see in 2018. DIRECTOR'S DOMAIN: Amid frequent hacks, leaks, and other costly security breaches, boards are seen as increasingly responsible for ensuring companies are doing everything they can to address cybersecurity issues. They are also being asked to justify excessive executive pay packages. New reports show that the gender pay gap is widest at the top. The Exxon Mobil board is bowing to investor pressure and agreeing to publish data showing business risks associated with climate change. The Xerox board has come under attack by activist investor Carl Icahn, who suggests the company is headed for disaster and needs a quick turnabout. And new statistics show that the handful of large companies with women-majority boards tend to outperform their peers. Meanwhile, a thoughtful piece in the New York Times examines the Etsy board’s decision to oust its CEO earlier this year and asks whether the social idealism that was intrinsic to that company’s culture could ever be compatible with the mandates of public markets. Read on. DIRECTOR'S DOMAIN: Harassment remains a bold news item for boards. Members of the Weinstein Co. board are named in a class action suit alleging that they covered up a pattern of sexual abuse by Harvey Weinstein. Venture capitalist Shervin Pishevar, cofounder of Sherpa Capital and also of Virgin Hyperloop One, steps down from various board and company roles amid allegations of harassment. An investment group urges the Amazon board to improve gender diversity among its senior management and to explain why former executive Roy Price was not fired for two years after sexual harassment reports were filed. And investment group Pax World Management suggests that when boards focus on gender diversity, equal pay, and fostering a culture that doesn’t tolerate harassment, their companies outperform those who don’t. Meanwhile, fat-cat boards beware: In the new year, shareholder services firm ISS says it will begin calling out board members who approve director pay packages that are out of step with rivals. Read on. DIRECTOR'S DOMAIN: When sexual harassment scandals rocked private unicorn companies Uber and SoFi, sending their CEOs to the sidelines, people asked, “Where was the board?” A report from news site The Information tries to answer that question and suggests that the boards of some of the nation’s largest private companies have focused more on preserving insiders' power than on establishing governance standards. When fake-accounts and improper-sales scandals rocked Wells Fargo, sending its CEO into retirement, people also asked, “Where was the board?” The bank responded by refreshing much of the board, announcing this week that three more new directors will join in the new year. Meanwhile, a review of director pay shows a number of board members now earn more than a half million dollars annually for their service. And an article in Harvard Business Review suggests that many companies are not doing what they could to ensure a strong pipeline for the C-suite, which is having the dual effect of slowing the careers of top talent while forcing many to look outside the company for chief executives. Surely that’s a situation worth addressing. Read on. DIRECTOR'S DOMAIN: Diversity is a hot topic this week: Money manager State Street reinforced its call for gender diversity in the boardroom, putting Canadian and Japanese companies on notice that it will vote against nominating committee chairs of any boards that do not have women directors. Apple, whose board has resisted pleas to create a diversity policy for hiring, released its diversity statistics, showing that its worldwide management team is 71 percent male. Meanwhile, studies show that hiring and promoting more women will reduce sexual harassment in the workplace more effectively than training programs and reporting systems designed to solve the problem. In other news: Uber’s board sets aside its differences to do a deal, estimated to be worth $10 billion, with Softbank. General Electric cuts six of its 18 board seats. Nelson Peltz may still get a seat on the Proctor & Gamble board. Venture capitalist Steve Jurvetson resigns from his firm and takes a leave of absence from the boards of Tesla and SpaceX as he faces allegations of sexual harassment. And Gretchen Morgenstern of the New York Times suggests that a judge’s decision to let a suit against Wells Fargo go forward is a not-so-subtle message to directors to take their responsibilities seriously, since being one of many bad decision makers is not a ticket to immunity. We will not publish Director's Domain next week. We hope you enjoy the Thanksgiving holiday. Read on. DIRECTOR'S DOMAIN: Cultural upheaval. Every day new revelations arise concerning sexual misconduct, gender discrimination, lack of minority representation—and more often than not, boards find themselves at the center of the storm. NPR (National Public Radio) and Israeli media company Keshet have both been roiled by sexual harassment allegations. Palo Alto Networks’s reluctance to release diversity stats has prompted investigative journalists to dig in. Uber is being sued for alleged systemic bias against women in performance evaluations. Cultural expectations for organizations are shifting rapidly—and savvy boards are at the forefront. While directors can not guarantee that an executive (or employee) won’t make bad decisions, the tone they set—which questions they ask, which incentives they approve, which ideals they promote—definitely influences behavior. We encourage you to read and share the recommendations offered by Boardspan’s own board: “Harassment Not Tolerated: 6 Questions Every Board Should Ask.” Also, don't miss the Harvard Business Review piece on how to build a pipeline for more women CEOs. In the spirit of boards continuing to hone their skills, ADP wins the battle to keep activists off its board, with an important lesson—learn what directors can do to minimize distracting, expensive proxy battles. Read more. DIRECTOR'S DOMAIN: Senators investigating Russian interference in the U.S. elections grilled the general counsels of Facebook, Google, and Twitter this week, while criticizing the companies for not sending their chief executives to discuss actions that may have had a sizable impact on voting in the last presidential election. Facebook CEO Mark Zuckerberg was instead paying a visit to China's Presdient Xi Jinping, along with Apple CEO Tim Cook and Blackstone Group CEO Stephen Schwarzman. Meanwhile Uber's former CEO Travis Kalanick presses for the continued control of several board seats--a point of friction that could jeopardize an investment of as much as $10 billion in the company. Samsung bolsters its highly profitable business with a new leadership structure. Also, this week brought a couple of great reads on leadership: The New York Times reports on the common qualities of CEOs and the Harvard Business Review reveals how to develop "a strategic executive voice." Enjoy! Read on. DIRECTOR'S DOMAIN: Board news continues to be dominated by sexual harassment, with The Weinstein Company board facing a lawsuit for its alleged knowledge of and failure to stop Harvey Weinstein’s “repeated acts of sexual misconduct.” Noted venture capitalist Steve Jurvetson, who sits on the boards of Tesla and SpaceX among others, has also been accused of sexual harassment and is under investigation by his firm. Discouragingly, a recent survey reveals that few boards ever discuss the topic of sexual harassment nor feel that it is an issue they need to address. A report in Harvard Business Review suggests that few women are promoted into the C-suite (and therefore onto boards) not because they act differently than men or have fewer interactions with decision makers, as is often suggested, but simply because of gender bias. Meanwhile, one commentator suggests that though boards currently act as if business strategy is removed from issues like immigration, climate change, or how women are treated in the workplace—boards are increasingly feeling the pressure to address social concerns. For those who prefer to be proactive rather than reactive, we recommend having boardroom conversations that ensure you are doing what you can to protect everyone at your organization from sexual harassment and its consequences. Read on and see "In Case You Missed It" for specific ideas. DIRECTOR'S DOMAIN: With the Weinstein Co. and 21st Century Fox boards facing scrutiny this week for allegations that their top executives routinely engaged in sexual harassment and abuse, it’s a good time to ask: What can the board do to detect and prevent workplace harassment? We have answers, thanks to a special post by the members of Boardspan’s own board of directors. (See below.) Meanwhile, Facebook promises it will soon add a person of color to its all-white board. A new report by PwC identifies six trends in the boardroom including an ongoing split in perceptions about diversity, with women directors more convinced than men of its value; the report also reveals that boards show less concern about climate change than do investors. Director pay is up 20 percent in the past five years. Read on, too, for stories about the State of California demanding more change on Wells Fargo’s board, and about the managing director of an investment fund being forced to step off several boards after espousing racist views in his newsletter. DIRECTOR'S DOMAIN: With every corporate crisis comes the question: “Where was the board?” The words seemed to form on observers’ lips even as allegations of sexual harassment stretching back decades were made against Weinstein Company co-founder Harvey Weinstein. The film production company’s board members, all of whom are male and half of whom resigned following the reports, pleaded ignorance. At least one columnist is suggesting that boards—notably those of the Weinstein Company, Fox News, and Uber, all of which have suffered major damage as a result of alleged sexual harassment—have a responsibility to address sexual harassment as a governance issue. In other news, a judge ruled that directors at Wells Fargo can be held personally liable for the company's egregious sales abuses. Activist investor Nelson Peltz is challenging the results of a shareholder vote which Procter & Gamble says did not win him a board seat. But his firm, Trian, did land a seat at GE, where the CFO and two vice chairs announced their departures a week after former CEO Jeff Immelt vacated the chair's seat three months earlier than expected. And, as Harvard Business Review this week takes a look at how some CEOs are promoting more boardroom diversity, McKinsey & Company’s 2017 Women in the Workforce report shows women are not making strong gains anywhere in the corporate world and especially not in the C-suite, which is a frequent precursor to the boardroom. Read on. DIRECTOR'S DOMAIN: Values are only valuable to the degree they are embraced. So, at a time when too many corporations are accused of failing to safeguard the best interests of their customers, employees, and shareholders, boards are increasingly looked upon to monitor a company’s commitment to their values. In the same week that the former CEO of Equifax and current CEO of Wells Fargo appeared before Congress following failures at each company to protect their customers, a blue-ribbon commission suggests that boards should formalize their role as monitors of company culture. This attention to values is perhaps all the more important in an era in which CEOs are speaking out more readily on political issues, and shareholders are increasingly holding companies accountable for enacting responsible social policies. Meanwhile, Uber, whose founding CEO was ousted over issues of company culture, saw its board grow by two last week, after former CEO Travis Kalanick filled two seats unbeknownst to other board members; this week, the board met and put new structures in place to limit his power, while agreeing to take on billions more in investment. Of note, GE’s Jeff Immelt has retired his chair seat earlier than expected and is free to pursue new opportunities. Read more. DIRECTOR'S DOMAIN: Clearly, boards today face bigger challenges and more public attention than ever before. Just consider a few items from this week's news: At Equifax, the board not only said goodbye to its chairman and CEO Richard Smith and began a search for his replacement, but it is diving into an investigation of the data breach that exposed the personal information of 140 million or more people, as Congress conducts its own investigations. At Facebook, CEO Mark Zuckerberg and his board withdrew a class reclassification proposal in the face of a shareholder lawsuit and a Congressional inquiry into the company’s dissemination of “fake news;” the new classes of stock would have enabled Zuckerberg to maintain control of the social media behemoth while selling his shares. At Procter & Gamble - one of the many companies dealing with activist incursions - the fight to keep Nelson Peltz off the board has led the activist investor to launch a full-on persuasion campaign, with the former CEO and directors of Heinz, as well as shareholder advisory firm Glass Lewis, now pleading Peltz’s case in the media. On a positive note, Salesforce CEO Marc Benioff was recognized for his role in closing the gender pay gap at the company, at a cost of $6 million (and an undoubtedly huge savings in potential lawsuits and PR headaches had he not chosen to do so). In other news, a new report suggests that when sitting CEOs take on outside board appointments, they tend to be handsomely compensated and their own companies tend to perform well—but the companies on whose boards they sit do not always enjoy similar success. All of which would suggest that it's a good time for boards to apply some basic risk management principles to the board itself: Step back and consider whether you have the right people, processes, and priorities in place today to deal with whatever comes your way tomorrow. Get all the details. DIRECTOR'S DOMAIN: The Equifax breach, which exposed millions of people’s personal data, has not only prompted federal investigations, but also soul-searching about what other companies should do to prevent similar disasters. Board and information security experts alike say its time to take a fresh look at the board’s role in monitoring cyber risks and to establish best practices for comprehensive security oversight. If you read the business ethics article from Harvard Business Review below, you will likely conclude that, regardless of how much formal responsibility directors have for cyber oversight, the health of every organization requires them to take it seriously and Do The Right Thing. In other news, it’s been a big week for board appointments, with new directors welcomed at Intel, Microsoft, eBay, Twitter, and Hampton Creek, among many others. What a good moment to read up on the new trend in mentoring: assigning novice directors a more experienced Board Buddy to guide them. Also, Procter & Gamble analyzes the long-term impact of Nelson Peltz’s tenure on corporate boards. The results are eye-opening. Read on. DIRECTOR'S DOMAIN: Another week, another board facing the fall-out of a tech company’s alleged culture of sexual harassment. Times two. Media reports suggest that board members at Social Finance, a fintech startup valued at $4 billion, had been informed about accusations of sexual harassment and also of financial misrepresentations to investors long before CEO Mike Cagney offered to resign on Sunday. The New York Times presented a blunt assessment: “Companies like SoFi show how boards are incentivized to prioritize cash flow and growth over governance, said David F. Larcker, a professor at Stanford University’s Graduate School of Business who specializes in corporate governance.” Apparently a culture of sexism and workplace hostilities led the board to fire LiveOps CEO Keith Leimbach this week, as well. Both cases, which have a striking similarity to the summer's events at Uber, underscore the real costs to a company, its employees, and its investors when a company's culture takes a backseat to its growth. Melinda Gates offered up her opinion on sexism in tech this week, which we might summarize as: It’s good we’re finally talking about it, since that is the first step to changing it—and the place to start that change is with venture capital. Kudos to Gates for not just naming the problem, but working toward a solution! And, now might be a good time to have a look at the latest from the Boardspan Library: “Six Ways to Promote a Healthy Company Culture," which provides a roadmap for boards that want to assess company culture. If it wasn't obvious before, it's certainly crystal clear today that culture is an indicator of value and the board owes it to all constituents to make oversight of the company culture a priority. Read more. DIRECTOR'S DOMAIN: Taking the long view: Investment firm Vanguard, with more than $4.4 trillion in assets under management, issued a letter to directors of public companies this week, pressing them to address governance issues like board diversity and the risks of climate change. The Vanguard letter underscores the firm’s belief that a company’s approach to board composition and climate risks both have an outsized impact on long-term value. Meanwhile, the Wells Fargo board comes under more pressure with the California Treasurer calling for the removal of one director and a banking industry group joining Senator Elizabeth Warren’s call for the whole board to be dissolved and reconstituted. Criticism rained down on the Uber board for leaking so many of its closed-door conversations to the media, while the Expedia board was lauded for its succession planning, after promoting an insider into the CEO role just days after its previous chief jumped to Uber. And a new KPMG report shows how boards are attempting to keep their companies one step ahead of policy changes, amid continued uncertainty about which policies the Trump administration will promote. Read on. DIRECTOR'S DOMAIN: Uber continues to dominate the news: It names an unexpected candidate for CEO, signals it’s ready to talk about an IPO, and learns that it is under investigation by the Justice Department. The fight over board seats between two of its biggest shareholders is moved from court to arbitration. Plus, high-level scuttlebutt suggests that after Jeff Immelt withdrew his candidacy, the board was unwilling to meet Meg Whitman’s conditions for leading the company, and had but one choice left: incoming CEO Dara Khosrowshahi. At least one shareholder thinks the board itself could use a new leader and is advocating for an independent chair. Now that’s an idea! This might also be a good time to read the 14 Rules for Managing Your Board, (below). Meanwhile, Disney adds GM chief Mary Barra to its high-powered board. New studies show the impact of activist investors on board composition—Hint: Diversity is not top of their mind. And one commentator suggests that venture capitalists may sit on too many boards to provide the oversight and strategic thinking that could propel those companies to greater success. Interesting times! DIRECTOR'S DOMAIN: Boardroom battles. They’re never good news and this week they continue to roil both ride-hailng company Uber and Indian IT firm Infosys, taking a toll on the market value of both companies. At Uber, the board’s composition and loyalties are being tested by lawsuits and unwelcome surprises, even as the company continues its search for a new CEO. Earlier in the week, the rumor mill had pegged GE chairman Jeff Immelt for the chief role at Uber, but by Wednesday the Wall Street Journal was reporting that Hewlett Packward Enterprise CEO Meg Whitman is back in the board's sights and that a decision is expected in the next two weeks. At Infosys, the board and founders have been locked in a months-long power struggle that prompted the CEO to resign last week, while shaving some $4.5 billion off the company’s value. Meanwhile, the boards of Chevron, Johnson Controls, and GoDaddy are preparing for CEO transitions, and paycheck processing firm ADP rebuffs activist investor Bill Ackman in his bid to reshape the board. Now seems an apt time to read "Conflicts In the Boardroom" (see below) and perhaps take to heart its advice to train board members in dealing with emotions and personalities, as well as governance and regulatory issues. Read more. DIRECTOR'S DOMAIN: Politics landed in corporate boardrooms this week, with a thud. On Monday, Merck CEO Kenneth Frazier, after talks with board members, resigned from one of President Trump’s business advisory groups to “take a stand against intolerance and extremism.” The CEOs of Intel and Under Armour soon announced their resignations from the president's council on manufacturing, too, after the president blamed “many sides” for the white supremacist violence in Charlottesville, Virginia. A comment posted Tuesday night on a New York Times article about the resignations caught our eye: “I'd imagine there are plenty of emergency board meetings going on right now with the actors deciding what to do.” It does seem “Ed from Silicon Valley" was on to something: By midday Wednesday, several more CEOs had publicly departed the presidential council, as civil rights activists pressured others. Then the members of Trump’s Strategic and Policy Forum—a separate group of high-profile executives headed by Blackstone Group CEO Steven Schwarzman—disbanded rather than find its members pressured to decide, individually, whether to stand by the president. As commentators remark, the political tensions in the country mark a new challenge for corporate leadership…. Meanwhile, Uber's directors appears to be locked in a battle for control of the company, and are firing off lawsuits, accusatory letters, and, allegedly, attempts to oust fellow directors. Wells Fargo announced that three of its longest tenured directors, including its chairman, will step down—and Betsy Duke will become the first woman board chair of a major bank. Plus, a new study of CEO pay suggests that smart bets on technological innovation tend to pay off handsomely for executives. Read on. DIRECTOR'S DOMAIN: Company culture. It’s a hot topic, as executives and pundits of all stripes weigh in on Google’s decision to fire an employee for posting a memo that questioned women’s inherent ability to be engineers. It’s also at the root of recent crises at Uber, whose CEO was fired after the company was accused of fostering chronic sexual harassment and discrimination, and at Wells Fargo, where experts say that a spate of scandals can no longer be written off as rogue behavior by one department or a few managers. When cultures cause crises, they become a problem for the board to address—and critics like to ask “Where was the board?” So, today we ask a more helpful question: "What can a director do to ensure a healthy culture is being nurtured?" Below are some answers, and here are a few hints: If you aren’t already, start evaluating the organization’s culture, character and values just as you would the financials. And get the right internal controls in place, including risk management and corporate governance, as well as executive compensation plans that favor good behavior. Then, you can carry on with the week’s news about activist investors, why directors leave boards, and how leaders can train themselves to be more agile thinkers. Read all about it. DIRECTOR'S DOMAIN: There is one place that no board wants to find itself: At the center of the story. Nevertheless, a week after rumors flew fast and furious about the various CEO candidates approached by the Uber board (to replace a leadership mired in accusations of sexual harassment and discrimination), the board itself landed in the spotlight. Various reports suggest that infighting and power struggles have upended the recruiting process and, perhaps, knocked out of the running the women being considered. As if on cue, its competitor Lyft announced a powerful addition to its board -- former Obama administration senior advisor Valerie Jarrett joins as the company's first independent director.... Big news for champions of women in leadership: A new study shows that, yes, women-run companies (where women are either CEO or board chair) do indeed outperform the market. And in somewhat less encouraging news, results from a large survey suggest that many directors find their boards are not performing as well as they could, and face special difficulty in these areas: Trust, Regard for Other Directors, and Communication. To remedy the issue, experts suggest director assessments to pinpoint issues, followed by board education to address them. We concur! Click here for more of the latest board news. DIRECTOR'S DOMAIN: Vote loudly and carry a big stick? That could be an adage of institutional investors lately, as more shareholders engage in board-level activism. State Street reported this week that it is making good on its promise to pressure boards to diversify—voting against the reelection of 400 boards that have no women directors. Massachusetts's $66 billion state pension fund voted against 69 percent of director elections this year, taking a stand against boards that don’t include women and people of color. And the International Brotherhood of Teamsters, which has been a longtime shareholder of drug distributor McKesson, was successful in rallying shareholders to vote against an executive pay plan, as a protest against the company’s alleged involvement in the opioid crisis. Perhaps not surprisingly, critics are calling for an end to voting rights for index funds and other so-called passive investors. Meanwhile, Hewlett Packard Enterprise CEO Meg Whitman steps off the HP board while rumors also circle that she’s under consideration for the role of chief executive at Uber. Google CEO Sundar Pichai steps onto the Alphabet board. And the Chicago Tribune has dug deep to help us understand the case of the mysteriously missing Hampton Creek board. All in all, a fascinating week for board watchers. DIRECTOR'S DOMAIN: Board diversity stats remain dismal. Women hold less than 20% of board seats in the Fortune 1000. Nearly half the companies that went public last year did not have a single woman director. And, as reported last week, men are more likely than women to get a seat without prior board experience…. But the good news is that change is on the horizon! Powerful investment managers like BlackRock are using their clout to champion the idea that diverse boards make better business decisions—and using their votes to challenge boards that fail to diversify. And companies that know these benefits are starting to lead by example. Next-generation real estate brokerage Redfin, asserting that early-stage board composition can have an outsize influence on company culture, has rallied an influential group--including four venture firms and Boardspan to commit to greater diversity in early-stage startup boards. We are excited to be part of this movement to strengthen boards. Read below for the details of the #DiverseFromTheStart campaign and for this week's other board news: activist investor Nelson Peltz's friendly outreach to Proctor & Gamble, Tesla's new board members, Hampton Creek's vanishing directors, the new breed of "digital directors" and more. DIRECTOR'S DOMAIN: Coming off a midweek holiday, board news is a bit thin this go-round with people away on vacation (or focused on politics).Yet, there are still dramas like the courtroom accusation that Martin Shkreli, when he was CEO of drug maker Retrophin, refused to obey his board’s directions and lied to its chairman. There is speculation about the Uber board’s search for a new CEO. And there are vocal shareholders questioning executive pay packages at Burberry. Nonetheless, this general lull in the action could be a boon to directors who take this time to dig into difficult issues, such as how to tackle risk oversight in light of increasingly prevalent cyberattacks. We feature two important stories on that theme this week: One suggests no business is immune from damage by hackers and that companies need to reconsider not just security but response to attacks. Another proposes that the entire Internet could be shutdown at some point and companies with a strong digital presence should plan now for such a possibility. Not exactly beach reading, but … taking cyber risk seriously could be just the thing to keep you relaxed all year round. Read all about it. DIRECTOR'S DOMAIN: Do the right thing. That is the message institutional shareholders increasingly are sending to boards by voting against directors who are slow to embrace governance reforms like board diversity or corporate social responsibility. Not surprisingly, some of those “right things” are translating into positive company results: A new study shows that greater board independence, separation of CEO and Chair roles, and other governance shifts have an impact on the bottom line. Meanwhile, the insistence of activist investors to achieve better results faster is prompting boards to remove CEOs from large, established companies at a rapid clip. With these added pressures on boards, cybersecurity oversight seems to have taken a backseat in the boardroom—but at an average cost of $4 million per breach, can a board afford not to take it seriously? Do the right thing, indeed! Read all the week's news. DIRECTOR'S DOMAIN: Another week, another firestorm thanks to a spectacular lack of decent behavior. Silicon Valley venture firm Binary Capital has been asked to exit the boards of several startups after six women came forward to accuse partner Justin Caldbeck (lead investor in GrubHub and TaskRabbit) of making inappropriate sexual advances. Knowing that a female CEO had him removed from her board years ago for unacceptable behavior makes the situation even more troubling. Meanwhile, Uber watchers accuse its board of looking the other way while the company’s leadership engaged in unethical and illegal behaviors: commentators say the board forced out CEO Travis Kalanick not because they cared about the company’s many alleged improprieties but because they worried about their investment value. And the allegations against Uber piled on with court documents claiming the board knew that the company was receiving stolen technology, and other sources reporting that Kalanick’s parting shot was to force Benchmark’s Bill Gurley off the board. Whew, that’s a lot of boardroom drama! To add insult to injury, another disappointing study was just released showing that men still have an easier time than women getting their first board seat. Now might be the time to take a deep breath and focus on how core values in the boardroom affect a company’s profitability, (see our featured article from the Boardspan Library). Executives and board members alike need to recognize that values will always have an impact. Act with integrity – or count on disaster. Read more. DIRECTOR'S DOMAIN: Summer and the livin’ is BUSY. Especially for the Uber board, which had already begun a much-talked-about search for a COO and a CFO, and now, following a shareholder revolt that ousted founder Travis Kalanick, is looking for a CEO as well. Sounds daunting. Plus the Uber board must now onboard two new directors, (Wan Ling Martello’s appointment was announced last week and David Trujillo's seat at that table was revealed this week), while considering shareholder demands to add additional independent directors. Meanwhile, the latest research shows that “fewer than 30% of organizations are able to find the right C-suite leaders” and Harvard Business Review suggests that often the trouble stems from a bad cultural fit. That news only underscores the complexity facing Uber’s board, which must pull together an all-new executive team that can not only deliver on the promise of a high-valuation company, but simultaneously lead a cultural turnaround. In other news… the Fortune 500 has seen its percentage of women directors dip to 28 percent, the first downturn in nearly a decade. What to think? Well, there's probably never been a better time to read Redfin's article in the Boardspan Library: How to Triple the Number of Women Appointed to Boards in Three Years! (Linked below.) Click to read. DIRECTOR'S DOMAIN: Leadership issues dominate the boardroom this week. First up, Uber: A seven-hour Sunday board meeting to discuss the results of former U.S. Attorney General Eric Holder’s investigation into the company’s culture and policies precipitated a leave of absence for the CEO, the exit of another senior executive, and the appointment of a second woman director. Then, at an Uber employee meeting where the news was announced on Tuesday, board member David Bonderman made an inappropriate comment about women in the boardroom that led to his resignation later in the day. Given that Holder’s recommendations include changes to the board and management structures, we expect more news from Uber in the weeks to come… Next came a handful of big CEO exits, with Marissa Mayer saying her goodbyes at Yahoo as the acquisition by Verizon was completed, Jeffrey Immelt announcing his retirement from GE sooner than many had expected, and Sheri McCoy reportedly leaving Avon amid pressure from an activist… It is a great time to give some thought to leadership—what it means, how to do it well, and whether the very nature of it is changing along with our changing world. See the Strategy+Business article below to consider a new view on the type of leadership most likely to make a difference today. Read on. DIRECTOR'S DOMAIN: (SPECIAL EDITION) If you read last week’s Director’s Domain, you might have noticed a brief break in our regular programming…just to be provocative. As you think about the three essential responsibilities for boards – Strategy, Performance and Governance – you may be wondering how you put them in play in your boardroom. Our best advice sits in the Boardspan Library. We curate board-specific content from thought leaders such as Deloitte, KPMG, Strategy&, McKinsey, BCG, Harvard, Stanford, MIT, and scores of others. They’re yours for the taking. Sign up now for a free Boardspan account and you will not only have access to a wealth of relevant information, you can save articles to your own personal library and share them with colleagues. Here’s a head start with some of our favorite articles. Click to see more. DIRECTOR'S DOMAIN: Not if—but when… Cyber attacks, like last week’s global ransomware episode, are becoming common enough that no company can guarantee immunity. Increasingly, boards are held accountable and must ensure that policies and practices are in place to prevent egregious hacks. One CTO and Board Advisor makes the case for boards to not only educate themselves about “security hygiene” and cyber disaster planning, but also discuss with management the risks inherent in decisions like managing costs by deferring software upgrades. On a different matter of deferring decisions, with every year that passes, Disney CEO Robert Iger gets closer to retirement and the board seems to get farther from a succession plan. Also intriguing, major shareholders of Occidental Petroleum won a vote—against the board’s recommendation—to require the oil company to report on the business impacts of climate change. And more CEOs are being ousted for unethical behavior—why? This and more in today's newsletter. DIRECTOR'S DOMAIN: What makes a board successful? Differing opinions on that topic are roiling boardrooms this week, as shareholders signal their displeasure with the board composition at many companies. Repercussions include mounting pressure to unseat the chairman of Canadian plane- and train-maker Bombardier and to reshape the board at shopping-mall operator Taubman Centers. The mere threat of shareholder activism prodded Whole Foods to announce it will replace half of its board this year, while Pandora announces a voluntarily board restructuring as it prepares itself for sale. Two Wells Fargo directors, who scored razor thin margins of support in last month’s re-election vote, also plan to step down, though only as a result of the bank’s age limits for board members. In the context of so much change, the question ‘What makes a board successful?’ deserves serious contemplation. You may want to look at the qualifications currently in vogue among large-company boards (see the Harvard Law School study immediately below) and consider the suggestions put forth by McKinsey in “Making Boards Work”, the culminating article in this week's newsletter. DIRECTOR'S DOMAIN: Ousted. It seems to be the word of the week as the CEOs of Etsy, Molina Healthcare, and money manager AllianceBernstein were all asked by their boards to step down. In all three cases, falling revenues precipitated the ousters and at Etsy the board appears to have been responding to pressure by activist investors. The president of the conservative think tank Heritage Foundation, former senator Jim DeMint, was also giving his walking papers, along with some blame for shifting the foundation’s focus from the formulation of intellectual and academic political arguments to political activism. For boards and executives who don’t want to find themselves at such odds, there’s no time like the present to revisit an organization’s strategy, ensure that the board and chief executive are truly aligned, and that the CEO has the feedback he or she needs to course correct if necessary…. In other news, the boards of BlackRock and Urban Outfitters are both drawing criticism for the long tenure of some of their members. And Mylan disclosed that, even amid financial controversy, such as the drugmaker experienced in 2016, its chairman was one of the best paid. Read on. DIRECTOR'S DOMAIN: What’s a CEO worth? Well, from the standpoint of company success, a lot. So it’s no wonder that directors devote serious time and energy to finding and retaining the right person for the top spot. Unfortunately, a new study suggests that boards are often not taking the right qualities into account when evaluating potential, or current, executives. (Suggested reading below: “What Boards Need to Know to Choose a Successful CEO.”) Regardless of how they are chosen—and sometimes even regardless of how successful they are—CEOs keep seeing their salaries race upward. Witness Yahoo CEO Marissa Mayer’s $200 million total take-home pay for five bumpy years and IBM CEO Gina Rommety’s new $50 million salary. The commentary on whether today’s CEOs are worth all that they’re paid makes for fascinating reading… And in other news: All the members of the beleaguered Wells Fargo board were re-elected, some by such a small number of shareholder votes that observers expect to see director turnover at the bank soon. Read more. DIRECTOR'S DOMAIN: Today the board of 21st Century Fox is schedule to meet, and the Fox network’s long-time star and cash-cow Bill O’Reilly surely will be on the agenda. O’Reilly’s departure from the network was announced yesterday, following reports that the TV personality had been accused by at least five women of harassment, spurring advertisers to leave the show in droves. One can only speculate what the male dominated 13-person board conversations might be in the midst of this turmoil. On another gender (in)sensitive note, others are speculating whether Wells Fargo's board appropriately and fairly doled out the consequences to its top two executives in its recent scandal. And on the more optimistic side of gender conversations, the CEO and CTO of Redfin (the online real estate company) suggest in a new article in the Boardspan Library, that it may be easier—and more valuable—than many have imagined to get more women into the boardroom. Read on. DIRECTOR'S DOMAIN: Tone at the top: Defining and demonstrating a company's values and culture is one of the most important responsibilities of the executive team and board of directors. So, when companies make major mistakes, as United Airlines did this week and as Wells Fargo did in recent years, customers, partners, shareholders and observers all swivel their heads toward the corner office and boardroom. One of the best commentaries on this comes from the Los Angeles Times, where columnist Michael Hiltzik suggests that if the leadership at United and Wells Fargo had created a culture of employee empowerment, they would not be fighting PR fires or paying fines for bad behavior. A Boardspan Library article from the Kellogg School of Management at Northwestern University points to research showing that companies whose employees perceive the firm to be ethical perform better financially. It makes sense that setting the right tone spares headaches and makes for greater success, but one hopes that boards and executives will promote values-based, ethical corporate cultures because it's just the right thing to do. Get all of the week's board news here. DIRECTOR'S DOMAIN: Moving the dial. Slowly but surely, women are making their way onto larger company boards, yet as they do, some observers note that surprisingly few are in the influential chair seats for executive, compensation, strategy or audit committees. Meanwhile, board member Arianna Huffington is again in the spotlight for her outspoken support of Uber CEO Travis Kalanick and her attempts to resolve widespread claims of a sexist culture at the company. At Snap, Inc., however, the lone woman on the board is likely in the same situation as her male colleagues: pondering what leverage the board has in a case where the founders have retained 90 percent of voting rights in the now public company. And, given the ongoing concerns about cybersecurity in all facets of life, you may want to learn about some common myths that, if not debunked, could undermine your company's ability to protect itself. Read more. DIRECTOR'S DOMAIN: When boards at the 100 largest companies in the U.S. set CEO pay last year, a few cut salaries, but many more increased executive pay, sending median salaries for some of the best paid people in the land up nearly 7 percent—to $11.5 million. Now institutional investors including CalPERS want to know how those salaries compare with what rank-and-file workers take home. The investors have sent a letter to the S.E.C. asking the Trump administration to push through an Obama administration rule that would require public companies to disclose the pay gap between CEOs and workers. And in other news: investment firm BlackRock, which manages more than $5 trillion in assets, is pressing for more board diversity of all kinds--expertise, experience gender, race, age. The firm will surely be interested in a study out this week showing that boards are heavily dominated by a single age group. Read more here. DIRECTOR'S DOMAIN: Reporters and critics have a lot to say about an SEC disclosure made by Yahoo on Monday stating that CEO Marissa Mayer will leave with a golden parachute of $23 million, after failing in her bid to turn the company around. The noise is even louder around the revelation that her successor, current Yahoo director and former IAC chief executive Thomas McInerney, will be paid double Mayer's salary for what some consider a less-demanding job. Meanwhile, the chairman of the British supermarket chain Tesco suggested the days are numbered for white men on boards of directors—even as Boardspan CEO Abby Adlerman sheds light on why some male-dominated boards are reluctant to respond to calls to change their composition. Read more. DIRECTOR'S DOMAIN: Women directors: Where are they? Financial services firm State Street wants to know. In an impressive display of shareholder activism, the world’s third largest investment firm with $2.47 trillion in assets is demanding that companies it invests in have at least one woman director. It promises a vote against the reelection of those board members responsible for nominating new members, should they fail to bring a woman on the board. Meanwhile the one female director at Uber, Arianna Huffington, is publicly defending CEO Travis Kalanick, as the company reels from a slew of scandals. And the institutional investors in Wells Fargo are considering withholding their votes from board members who might have moved faster to contain last year’s fake accounts scandal. Word to the wise: Shareholders are watching! Get all the news here. DIRECTOR'S DOMAIN: “Culture starts at the top.” The adage, which applies to management and boards alike, is something the boards of Uber, Wells Fargo, and others are likely grappling with this week. Commentators are prodding Uber’s board to probe into allegations that the car-service company has fostered a culture of sexual harassment and to consider whether CEO Travis Kalanick, who was recently caught on video disparaging an Uber driver, is the right man to lead the $69 billion company. Wells Fargo’s board meanwhile slashed bonuses for the whole executive team to “reinforce accountability of the company's leadership” following last year’s sales scandal, in which more than 2 million fake accounts were created by employees trying to reach mandated quotas. Certainly allegations of widespread unethical and/or illegal behavior should prompt a board to hold executives accountable and to press for meaningful cultural change. Even better would be for boards to take a proactive stance regarding culture and accountability—and avoid the scandals all together! Some basic suggestions to help any board get in front of these issues: Commit to transparency; pursue rumors or complaints until the board is satisfied it knows the truth; refresh directors frequently enough to avoid cronyism and complacency; and regularly undertake assessments of both CEO and board. It wouldn't hurt to meditate on that old adage, either, and assure yourself that the board is setting the tone you want others to follow. Read on. DIRECTOR'S DOMAIN: Big, bold shareholder activism. That’s what we’re talking about, as some of the nation’s most engaged shareholders disclose interests in major companies. Nelson Peltz targets P&G, with a $3.5 billion stake in the packaged goods firm. Carl Icahn steps in to ask for more changes at Bristol-Myers Squibb, which already this week bowed to demands from Jana Partners. Starboard Value takes a 6.6% stake in Tribune Media and signals its intent to shake things up. And that’s just the big players! One way to get ahead of this curve, and possibly forestall an outsider from making demands of your board, is to bring in more “activist directors” now. Most importantly, don’t let the drama swirling around shareholder activism keep your board from one of its most important and least understood tasks: Addressing cybersecurity threats. These are costly mistakes and the board should do all it can to avoid them. Read on. DIRECTOR'S DOMAIN: Another week of intrigue in the boardroom: Snapchat clarifies the compensation of the only woman sitting on its board, suggesting that the company will, in fact, pay her more than the previously stated 10 percent of what her male colleagues make. Fortune 500 boards report that they have welcomed more black women to their ranks in recent years, but have not increased the percentage of black men sitting on those boards. And, as the Volkswagen board denies new allegations that its members were warned ahead of the U.S. government’s probe into the automaker’s falsified emissions tests, Germany amends its corporate governance code to require companies and their directors to conduct business ethically and take responsibility for their behavior. Read more here. DIRECTOR'S DOMAIN: The year of activism? So far in 2017, American citizens have taken to the streets and corporate shareholders have taken up proxy fights with a vengeance. Autodesk, Buffalo Wild Wings, Perrigo, and Cognizant have all been in activist shareholders’ crosshairs this week. Mark Zuckerberg, too, is getting a little heat from shareholders looking for him to abdicate the chairman role at Facebook. Meanwhile, there is a lot of talk about a new report showing that, after initially driving hard to achieve greater diversity and bringing more women into the boardroom, the United States has fallen behind much of the developing world. Will we see would-be women directors taking to the streets? Unlikely. But we wouldn’t be surprised to see some creative form of board diversity “activism” on the horizon. Keep reading to get this week's news. DIRECTOR'S DOMAIN: ExxonMobil adds an atmospheric scientist to its board? Yes, you read that right. Some critics are crying ‘too little too late,’ but the Union of Concerned Scientists gives the oil company a thumbs up for appointing a climate scientist as a director. Meanwhile, a new activist investor-defense group at Lazard is using big data to help companies spot potentially vocal shareholders before they raise their voices. And boards looking to help their CEOs succeed (and thereby give activists no grounds for complaining) are turning to a timeless tactic: More and better feedback! Read on for the whole story. DIRECTOR'S DOMAIN: Wells Fargo is back in the news, with press reports alleging that early investigations into the bank’s cross-selling debacle were tainted: employees were apparently tipped off to internal inspections, giving them time to cover up illegal maneuvers before inspectors arrived. Also the bank now says it has found evidence that some employees who came forward to report the illegal activities were fired. Not a pretty picture. For some time now the culture at the bank and the role of the board in preempting bad behavior has been called into question. Today, Boardspan releases its own analysis of the responsibilities and challenges of board membership in this special report Leadership Matters: What Boards Can Learn from the Wells Fargo Calamity. Read it today! DIRECTOR'S DOMAIN: Ch-ch-ch-ch-changes. On the eve of the presidential inauguration, the news is thick with reports about the new administration: Incoming Transportation Secretary Elaine Chao will apparently continue receiving substantial compensation from Wells Fargo related to her prior role as a director at the bank. General James Mattis has reportedly left his board seat at Theranos to prepare for his new role as Defense Secretary. And President-elect Donald Trump’s lack of board service is examined—would he have a better sense of conflict of interest if he had ever sat on a public company board? Meanwhile, boards across the country are looking at expected changes to the economy, regulations, and more and wondering what’s in store for them. To answer this question and more, we’ve just released Boardspan’s Guide to 2017: 8 Key Issues Boards Face This Year, which we link to below. Please have a read and pass it on to colleagues who would benefit from knowing what to expect in the boardroom. We look forward to keeping you up-to-date and ready for what 2017 holds, all year long. DIRECTOR'S DOMAIN: We talk frequently about the increasing pressure boards feel, as everyone from regulators to shareholders holds directors accountable for a company’s actions. This week, we see that consumers, too, can take aim at boards for behaviors they don’t agree with. Witness the boycott called against L.L. Bean after one of its board members was reported to have contributed to the Trump campaign. There's not much directors can do about increased scrutiny, besides ensuring we act with integrity and consider decisions carefully, knowing they might be perceived differently by others. As Harvard Business Review suggests, we can all get better at identifying ethical decisions and perhaps seeing the potential consequences before we make a move. Meanwhile, Yahoo announced this week that many directors—including CEO Marissa Mayer— will be leaving the company’s board once the deal with Verizon closes. And a dispiriting new report shows that at many companies, “diverse directors,” i.e. women and people of color, are paid less than their white, male counterparts. Read on. DIRECTOR'S DOMAIN: Happy New Year! Prognosticators have been busy chronicling what to expect in 2017. Their best guesses include more corporate scandals, more cyber attacks, and less regulation all around. One might also assume that individual directors will be appointed to fewer seats, as both ISS and Glass Lewis have placed new focus on the issue of directors “overboarding.” Meanwhile, some new board appointments have garnered attention, including former DuPont CEO Ellen Kullman’s election to the Goldman Sachs board, and the announcement that former Genetech CEO Ian Clark will begin serving on three biopharmaceutical company boards. There is also talk of a handful of young, female technology entrepreneurs becoming sought after as directors for larger company boards. While it's likely terrific for those invited and the boards they serve, we still have a long way to go before women are included as a rule, not an exception, given that only 20 percent of large company board seats are currently filled by women. Here’s wishing you a successful 2017! 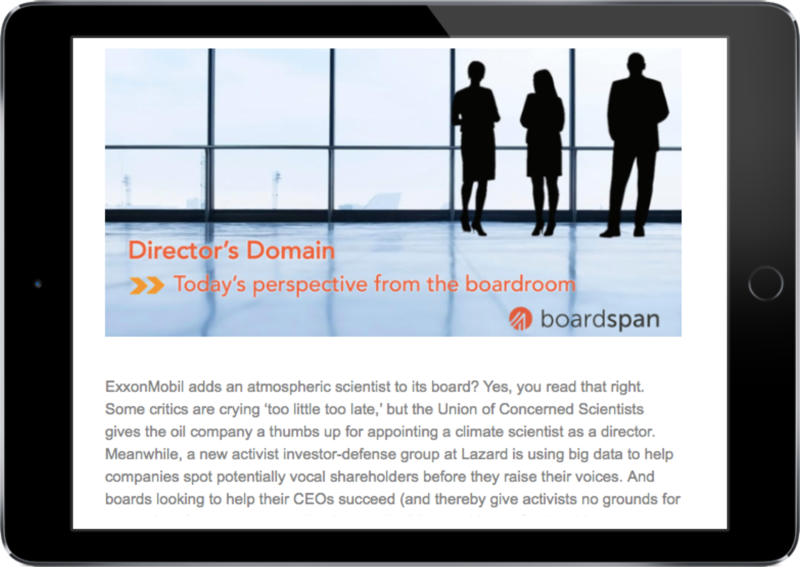 Let us know how Boardspan can help turn your board aspirations into reality this year. Read more. It's a quiet time in the board room -- the lull before the storm of regulatory changes and strategy updates as organizations sort out what the new year and new players could bring? Two of this week's articles reflect opinions about what a Trump administration might mean for board rules and Dodd-Frank regulations. Another examines how those companies with directors likely to take part in the new administration are already faring well. Meanwhile, research shows that the number one skill that innovative CEOs have in common is their ability to manage risk. That seems like an important competency to hone in the year to come. See the piece from our archives, below, to learn more. Transition time. Next year is shaping up to be one of big changes: Starbucks will try an unconventional CEO transition with Howard Schultz handing off the chief role to his number two, but staying on as chairman and in a new operational role. Theranos will remake its board with fewer politicians. Chipotle, too, looks likely to shake up its boardroom. Meanwhile, a new Stanford University survey of corporate boards reveals common issues today’s directors face, plus some suggestions for solving them. And this week’s newsletter is filled with good advice for your new year: How to plan a CEO transition; how to think about governance for subsidiaries of larger firms; and how to be a more effective leader. We hope you find it valuable. When employees share their concerns or whistleblowers make noise, it doesn't hurt to listen. Yesterday, the Wall Street Journal published an intimate look into the experience of the man who apparently went public with his concerns that blood-testing company Theranos was fudging its research. The employee in question landed the job through his connection to Theranos director and former Secretary of State George Shultz, who happens to be the man's grandfather. (It's quite a read.) And this week several major shareholders said they are looking for changes to the Wells Fargo board in the wake of the false-accounts scandal that cost the company its CEO—a scandal that some say was first revealed to the board by whistleblowers five years ago. Meanwhile, a new study shows that the quotas some European countries have put in place to ensure gender diversity on boards has resulted not only in more female directors, but an overall positive experience for directors and more professionalism in the recruiting process. Enjoy this week's issue and ... have a Happy Thanksgiving! We won't publish next week, but will see you back here on December 1. While the boardroom is fairly quiet this week, there are a few things that caught our attention. For starters, we look at how much directors are paying themselves—the median salary for directors of S&P 500 companies is about a quarter of a million dollars a year, with some earning into the millions, presumably for a job very well done. Next, we are back to Wells Fargo, which is hoping to avoid litigation by settling yet another accusation of wrongdoing—this time for overcharging mortgage holders for home appraisals the bank required of those who had defaulted on loans. Meanwhile, commentators offer some advice to the bank’s board about refreshing the company culture, even as a group of senators questions why KPMG, the bank’s long-time auditor, didn’t discover signs of malfeasance. We find some rich insights on how a board can help grow a sustainable business that activists will leave alone, as well as advice from one of the best-known activist investors, Nelson Peltz. And, since we can’t help but think that now is a great moment to step back and think about the board’s role in creating responsible corporate cultures, this week we highlight “Business Ethics Begin in the Boardroom” from the Boardspan Library. Read more. Boards under scrutiny: Even as former Wells Fargo CEO John Stumpf vacated his board seats at Target and Chevron in the wake of the “cross-selling” scandal that cost him his job, the California Department of Justice yesterday announced it is conducting a criminal investigation of Wells Fargo, seeking evidence of identity theft when the bank opened millions of accounts without customer’s permission. Critics suggest that 1) the board should have noticed the evidence of wrongdoing earlier; 2) it should have split the CEO and chair roles—pairing Stumpf with a strong overseer; and 3) at a minimum, it should have sent strong signals that it valued propriety above profits. Congresswoman Maxine Waters is now questioning whether the Wells Fargo board, even today, is supportive of real structural and cultural change since it appointed as its new CEO Tim Sloane, a 29-year Wells Fargo veteran. Meanwhile at Facebook, CEO and chair Mark Zuckerberg apparently received enough negative feedback that he felt obliged to defend much-maligned board member Peter Thiel after Thiel’s $1.25 million donation to the Trump campaign. Any board facing criticism might consider what it needs to do to ensure the public’s trust—one thing that no successful business can be without. Read on to learn the basics for building, or rebuilding, trust. Lest you think that debates are for the politically minded only, one can only imagine what conversations are going on across many a boardroom this week. With Twitter’s board deciding its future – and it may not be entirely up to them – and Wells Fargo playing “whack-a-mole,” there’s some tough talk at the board table this week we surmise. Speaking of tough talk, see what the activist investors are voicing opinions about this week: woes at Samsung in one case and the need for more women in the boardroom in another case. You go, girl. And batting clean up this week, a broad range of views on compensation from top to bottom, from the US and the UK. With compensation season just ahead of us, we can’t resist the temptation to go deep into the archives and share an opinion that feels like it was written yesterday. Catch up on all the board news. Culture clash. Led by the fiery prosecutorial instincts of Senator Elizabeth Warren (D-Mass), a former Harvard law professor, the Senate Banking Committee took Wells Fargo CEO John Stumpf to task this week for his accountability in the bank’s “cross-selling” strategy, which resulted in some 2 million false accounts being created in the names of Wells Fargo customers. Stumpf, in turn, leaned on his board, stating that it was not up to him as Chairman and CEO, but to the bank’s other directors to decide whether executives who oversaw the tainted division should be fired or financially rewarded for their service. (If you didn’t catch this real-life political drama as it unfolded in the Senate chambers, it’s worth watching.) Criticism of the Wells board is rolling in and it’s not hard to imagine there will be a lot more conversation about the board’s responsibility for protecting consumer and shareholder interests, as well as following through on the company’s stated mission of building a culture of accountability. For a thoughtful take on the significant role board culture plays in a corporation, be sure to read “The Anatomy of Board Culture” from our archives. And then, consider the news that GM now has as many women on its board as men—and hasn’t even tooted its own horn about this milestone. For the whole story, keep reading. Change is hard--especially when it's someone else's idea. But when it's clearly due, "resistance is futile" (we say, outing our inner Trekkie.) So goes the news in the boardroom this week: investors in Mylan and Chipotle are complaining, as they point fingers at the boards for the companies' shortcomings and demand changes in board composition. Meanwhile, the Twitter board is reportedly meeting today to discuss whether to pursue a buyer or some other remedy for the troubled social media company. Plus, American and United Continental Airlines have settled some kind of executive poaching/CEO succession planning skirmish, with a long-time American Airlines exec moving into a top slot at United Continental, and both companies aiming to spin the move as a victory. Exciting times for those boards, no doubt. Get up-to-date now. How boards think and “feel” about issues makes a difference: The board of Mylan, critics say, should have demanded that the company curb its price increases to keep the EpiPen affordable—and to spare the firm the media bloodbath of recent days. Others are wondering if the board of the Tronc media company is wise to continue rebuffing the acquisitive advances of Gannett. And new research suggests that boards packed with industry experts may actually have a harder time making the best future-looking strategic decisions. This and the latest news on women in the boardroom, “undesirable” CEOs, and the Uber-Alphabet boardroom breakup in this week’s Director’s Domain. The end of summer. And the end of a gripping season of board drama at Viacom, as CEO Philippe Dauman is forced out (with a widely criticized $72 million settlement package), while the Redstone family wins the privilege of a board makeover. Never fear… a new and fascinating board drama begins airing in its stead, as an activist investor (and Carl Icahn protégé) looks to replace the entire board of the Williams gas pipeline company, months after half the board resigned following a failure to oust the CEO. Follow these storylines, plus news on employee pay raises, the board’s role in managing cyber risks, and the preponderance of Republicans on boards in this week’s newsletter. The latest news to get diversity advocates riled up? A study showing that companies with women in the CEO seat are more likely to be targeted by activist investors. The latest news to, perhaps, energize them? A report from the Wall Street Journal suggesting that some companies are aggressively recruiting female directors, sometimes narrowing the field to just women candidates. For a pragmatic discussion about diversity—why it matters and how your board might reasonably achieve it—take a look at the Conference Board article, “How Much Difference Does ‘Difference’ Make.” Get it all in this week's Director's Domain. Establishing appropriate executive pay is a pain point for a lot of boards: What’s the right package? What’s the right process for determining it? Some of the biggest names in tech are now “disrupting” the common practice of linking pay to performance, potentially opening the door to a new era of compensation practices. Meanwhile, a Texas A&M study questions whether boards can be effective monitors of executive performance. And, speaking of effectiveness, you might improve yours by better understanding your leadership style. Read all about it in this week’s issue. Disappointed. How else to feel when reading that the latest research reveals that women and minority corporate directors make less than their fellow directors serving on the same boards? Rather than letting discouragement set in, though, why not focus on what you can do to make a difference? You might start by reading MIT Sloan Management Review’s ideas for promoting greater diversity in the boardroom. Meanwhile, critics of the “Commonsense Principles of Corporate Governance,” (issued last week by a group of prominent corporate leaders), say the guidelines need to go farther to ensure that non-executive directors have a larger role in engaging shareholders, that boards take seriously their responsibility for enterprise risk management, and that director tenure and age limits become commonplace. Catch up on the details. How common is common sense? This week, the governance narrative turns to a discussion that should not be very contentious; however when the definitions of “common” and “sense” are in the eye of the beholder, controversy abounds. Are VC’s paying enough attention, are government leaders paying too much attention, are corporate board members paying the right level of attention? All that, and a board paying its CEO to create the right “tone at the top” while another board fires its CEO for missing the numbers. Lots of opinions this week: from Sacramento to Washington, New York to London, Philadelphia to Stockholm. So we ask, where is the common in common sense? Read more here. Board politics. While power moves within the board room are hardly novel, the phrase is taking on new meaning as politicians, including Hillary Clinton, Donald Trump, and Britain's Theresa May weigh in on governance issues like board composition and executive compensation. Meanwhile, Facebook finds itself, again, defending the rights of its provocative director Peter Thiel to take actions that don't represent the views of the board, this time as he takes the stage at the Republican National Convention in support of Trump... If this campaign season is giving you—and your CEO—a little agita, you may want to read on to understand how anxiety impacts a CEO's decision making and learn how the board might work with an anxious executive to ensure the best outcomes. Read more here. Tumultuous times: Nearly half the directors at pipeline giant Williams Co. resign when a move to oust the CEO is blocked. The entire board of digital privacy nonprofit The Tor Project is refreshed by its new executive director, whose predecessor resigned amid accusations of sexual abuse. The $12 billion Hersey Trust sees its third trustee resign as the Trust confronts demands for governance reform from Pennsylvania’s Attorney General. The all-volunteer board of the defunct nonprofit Architecture for Humanity faces a $3 million lawsuit for financial mismanagement. And not surprisingly, the implosion of blood-testing company Theranos inspires new levels of scrutiny of the sometimes lax governance practices of Silicon Valley’s venture capital-fueled startups. It sounds like time to focus on doing what's right—see below for "Integrity is Free"—and to take note of the bright spots, including the increasing diversity on prominent boards such as Intel, Accenture, GoPro, and …Boardspan! Read all about it. Silicon Valley dominates this week’s board news: With the retirement last week of Nike founder and chairman Phil Knight, Apple CEO Tim Cook steps up as lead independent director of the Nike board—and critics immediately begin asking if Apple can afford for its leader to have any competing priorities. Yahoo CEO Marissa Mayer also hears from nay-sayers, with more than 100 million shareholder votes against her re-election to the company’s board last week. And Twitter announces its latest addition to the board is former Facebook CTO Bret Taylor. Meanwhile, the story of how Google board member Diane Greene became an executive at the company makes for a good read. Check it out here. Sensational times in the boardroom. Volkwagen's board is accused of knowing more than previously believed about "Dieselgate." The Viacom board has been pretty well deconstructed and remade in just one week's time, with continuing repercussions. And Lululemon's board has been rumored to have a "ghost" in its midst. Meanwhile, Tom Monahan, the CEO of CEB, argues in Harvard Business Review that boards, in their necessary effort to mitigate risk, might miss out on some opportunities to add strategic value—and he has some suggestions for doing better, including being a bit more daring. Read all about it here—then guarantee yourself a bump in popularity by sharing Director's Domain with a friend or colleague. Interesting behavior abounds. There are calls for Paypal founder and Facebook director Peter Thiel to resign from the board of the social media giant; Facebook is becoming a powerful media player and is a business partner of Gawker Media, the gossip site Thiel is purportedly trying to sue out of existence. The Viacom board is fighting against the presumed wishes of its largest shareholder and former chief, Sumner Redstone, in an intensifying battle for control of the media empire. The former chief of Valeant Pharmaceuticals, who stepped down amid a massive scandal that cost the company billions, gets a $9 million severance package, while the Theranos founder whose company is under federal investigation for various alleged infractions sees her presumed wealth in the company plummet to zero. And Uber offers up a board seat to its newest investor: a Saudi fund that has made the largest-ever investment by a single investor in a private company: $3.5 billion! For all the news and some fascinating stories on corruption-promoting cultures, CEO pay, and women directors, read on!